SlugFest Games - Announcing the Red Dragon Inn Character Design Contest! We are stoked about today’s announcement. 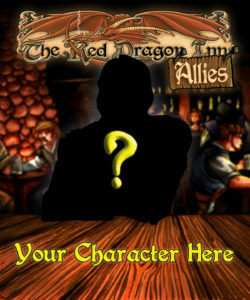 As you can probably guess, we have been hard at work designing new Red Dragon Inn characters that we know you’ll love. However, we really want to see what you guys can come up with! SlugFest Games is happy to announce the Red Dragon Inn Character Design Contest! Do you have an awesome new game mechanic, a hilarious take on a classic RPG trope, or a brilliant story you’d like to share about a new recruit to The Party? Design an awesome RDI character, and we just might print it! Your submission must include a signed Contest Waiver. Any character design submitted without a signed waiver will be immediately deleted. We will be accepting contest submissions through December 31, 2014 at 11:59 PM Pacific Time. Submissions received after that time will be deleted. Honorable Mention(s) will receive $250. So if you’re a budding game designer, or if you’ve had a homebrew character kicking around the table for years, it’s time to show off! As the Contest Waiver states, we reserve the right to award any number of prizes, including none. In addition, receipt of your prize will be contingent upon assigning exclusive rights to your design to SlugFest Games.